The Prague Centre for Jewish Studies is currently holding its first annual conference: “Jewish Studies in the 21st Century. Prague – Europe – World” (program – mostly in Czech). On Thursday, October 18, I attended the literary segment of the conference at the Clam-Gallasův Palace and under five imposing crystal chandeliers heard various presentations about Czech and Jewish literary issues. Among these there was a particularly interesting talk by Josef Čermák on Kafka’s Hungarian-Jewish friend and fellow tuberculosis sufferer Robert Klopstock. I have written about Čermák’s talks on Kafka before and his perspective on the recently resolved manuscript trial, for example, was a refreshing change from those of the many clueless journalists (World Awaits New Kafka Masterpieces!) not to mention equally clueless award-winning American academics with political agendas whose writing about Kafka seems to somehow lose sight of the fact that he was, you know, a fiction writer. 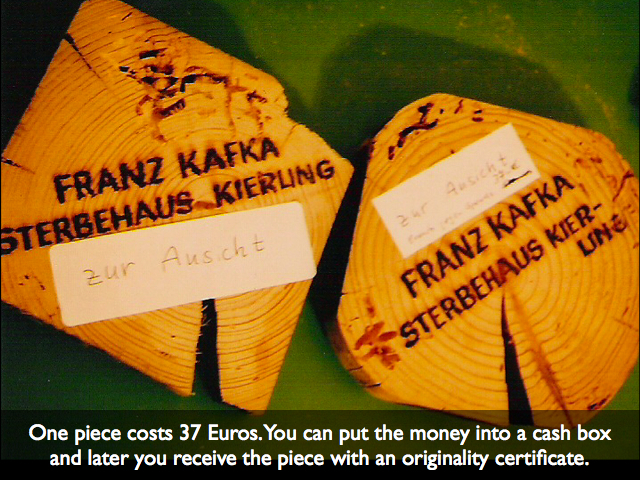 – Pieces of the old wooden balustrade from the Hoffmann Sanatorium which can be bought for €37 and include a certificate of authenticity. This might be taking Kundera’s “Castrating Shadow of Saint Garta” a bit too far. Čermák’s talk brought up another category of Kafkaites – novelists. Klopstock was involved in Kafka’s life at the very end and was very much trying to get him to turn back toward conventional medicine from the alternative treatments he was pinning his hopes on. Čermák described the Austrian sanatorium where Kafka died, with treatment involving things like having the patients singing “funny songs about death.” I’m not a doctor but that sounds like a truly terrible idea, though Čermák said the writer was too ill at that point to be subjected to these activities anyway. Čermák referred rather sardonically to a recent German novel depicting Kafka at the end of his life taking long romantic walks with Dora Diamant when in actuality at the sanatorium he couldn’t even stand up anymore. The novel in question is presumably Die Herrlichkeit des Lebens (The Glory of Life) by Michael Kumpfmüller and is described on the New Books in German site as a love story that “offers beautiful insights into what really makes life worth living.” I think I’d prefer to sing funny songs about death. The novel also features a friend of Kafka’s named Robert. Go figure. 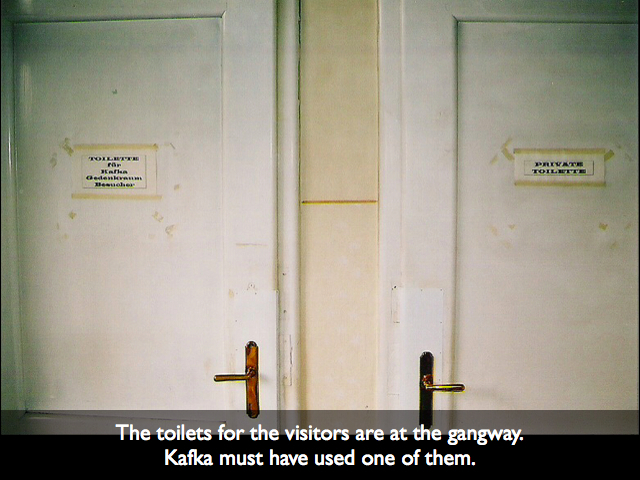 – Toilets at the former sanatorium (no further comment). Klopstock sounds like he could make an interesting subject for a novel himself, with Kafka gently (I assume) discouraging him from pursuing his literary ambitions and instead pushing him to keep up his medical studies. Klopstock not only survived his tuberculosis, but the horrors of the 20th century and ended up a successful professor of lung surgery at Downstate Medical Center in Brooklyn, New York. He died in 1972, avoiding writing or speaking about his famous friend in later years. And he has another connection to German-language literature, having possibly supplied Klaus Mann with the drugs he used to commit suicide in 1949. Almost as interesting was Klopstock’s wife, Giselle, who translated some of The Trial into Hungarian (as Bruno Schulz’s fiancé Józefina Szelińska translated the novel into Polish) and who was, according to Čermák, a very good writer.